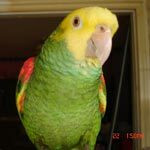 I think this will be a very helpful information to the people who are want to know about the caring of parrot. And I hope you will give more information about this in coming days too. I was so happy to read that. The NC zoo had a bumper crop of orphaned Chimney Swifts so as soon as they started to fly they were put out in a large flight cage. When it came my turn to feed them I asked how do you know when they have had enough and was told to just stop feeding when I got tired. I did not agree with some of the methods used with the animals. When I went in I was mugged by a bunch hanging near the door but also had some standing back. The ones hanging back were not being fed enough and could no longer fight for their share. I fed from the doorway and as they got full they moved away from the door and the others had a chance to get food. They had been making a lot of racket all the time but when I was done with them they were silent. Everyone got a feeding and were content. I was asked why they were quiet. I knew it was because all their little stomachs were full but I could not impress this on the others. The lady in charge just did not have the feel for the animals she was responsible for so I started educating the other volunteers who all accepted the info. I was not favored by the woman in charge. So it is good to read that the little ones who were smaller and pushed to the back grew up stronger than the stronger one. No, no, you misunderstood. It doesn't mean that when they go hungry as babies they grow stronger, it means that they grow up with an eating disorder when enough is never enough so they always end up overeating. It happens a lot with pet birds because it's common for the little ones not to be fed as much as they need with they are babies or when they are weaning. Hi, Peter, welcome to the forum! And, yes, that is exactly the problem and why so many pet birds end up constantly begging for food.